HÀ NỘI – The nation’s education system could see a paradigm shift from knowledge acquisition to how students can use knowledge to solve problems. A draft curriculum for comprehensive education reform could very well shatter the typical image of Vietnamese schools as places where students learn the same things and have the same ideas. The curriculum, in preparation for about three years now, seeks to bring about the most “drastic and positive changes” to the nation’s education system. Drafters are hoping that the curriculum will address frequent public criticism of authorities’ failure to create a practical curriculum for K-12 education in the country. Accordingly, the General Education Renovation Project has an overarching objective of raising students’ learning outcomes, officials say. They add that the curriculum will be revised using a competency-based approach and improving the effectiveness of instruction by creating and disseminating content that aligns with the revised curriculum. Nguyễn Minh Thuyết, the programme’s chief technical officer, said the new general education curriculum aims to develop the key qualities and competencies of 21st century citizens. It starts with a conception of the “ideal graduate” as someone who has developed ethically, intellectually and physically, and who can apply learning to real world challenges. “This can be considered a breakthrough in the way we approach the problem. Previously, educators asked: ‘What do WE want the students to know?’ Now we try to seek the answer to the question, ‘What can students do, and how?’”, Thuyết said. Basically it’s the well-known competence-based approach to education, which, although not new to many countries, is a paradigm shift for a system like the one that Việt Nam has at present. “We are finally taking the right path,” Thuyết said. Thuyếtt said employers have emphasized their need for employees who are equipped not only with technical skills, but also with cognitive and behavioural skills, such as the ability to think critically, solve problems, and communicate properly. “Apart from weaknesses like the lack of practical skills and creativity another important fact is that many Vietnamese youth still don’t have big dreams, big visions, and are often easily satisfied with their initial achievement,” Thuyết said. “That’s why we need to work to change things,” he said. The targeted changes include a flexible curriculum that has ample space for elective subjects and follows an interdisciplinary approach at the lower levels and an individual, career-oriented one at the high-school level, as also a pedagogy that combines both lectures and out-of-the-classroom activities. 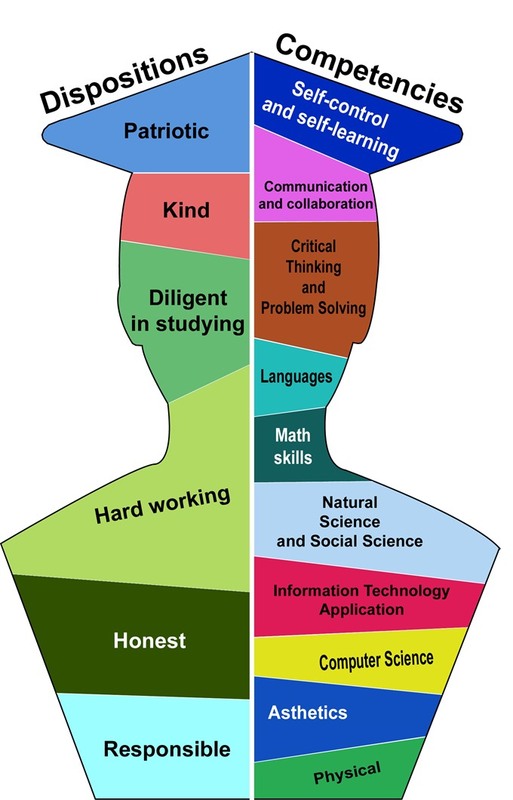 The “graduate profile” of a student emerging from the renovation project would be a person with certain qualities and competencies. The qualities a student is expected to have include patriotism, kindness, diligence, honesty and responsibility; and the competencies include self-control, independent learning, communication and collaboration, problem-solving and creativity, as also core competencies in languages, mathematics, social sciences and natural sciences research, technology, computer science, aesthetics and physical capacity. Thuyết said the detailed curriculum will be developed in the months to come, but it will surely be “competency-based,” promoting the emergence of graduates with cognitive and behavioral skills necessary to gain employment and promote economic growth. Alongside the flexible curriculum, another important change planned to the system is the development of pedagogies that support the ability to apply knowledge and minimize rote learning and memorization. “We understand that the task to transform Vietnamese teachers into professionals capable of providing new content and employing new instruction methods is an essential element. To affect this change, teachers will need more customized support,” Thuyết said. Despite the considerable efforts made by the drafters of the curriculum, the feedback has been mixed. Some experts said the workload was still huge for K-12 students, and others expressed disappointment at the lack of breakthroughs in the curriculum. However, Trần Thị Mỹ An, a senior education specialist from World Bank, said she and other specialists were highly appreciative of the efforts made. “The draft document for this comprehensive program is an important step towards the reform of the general education system in Việt Nam. The overall curriculum describes in great detail many of the curricular reform agenda and objectives associated with reform,” she said. “The … programme clearly identifies core qualities and core competencies of students expected at the end of the general education curriculum; this helps shaping the development o specific subject curricula and learning outcome standards and guiding the curiculum rolling out as well as student assessment,,” she added. Among many people offering their two cents’ worth was Trịnh Ngọc Anh, a PhD student in Education at the University of Canterbury, New Zealand. In a comment that touched all key parts of the curriculum, she said key components should be visions, values, missions and principles that are relevant to Vietnamese settings. She suggested that apart from learning from and emulating good practices in other countries, other stakeholders like teachers, parents, students in the country are consulted. This can create an open and engaging spirit, and inputs from these stakeholders could generate more effective, appropriate and achievable goals for the plan. She also felt an interdisciplinary approach should be adopted to achieve core competences rather than putting them in different lists. She said competence in problem-solving should be put at the centre as it includes many significant sub-competences like critical thinking, creative thinking, communication, collaboration, co-operation as also independence. “Intercultural competence” should be added to the list, she said. “The dispositions, or qualities, are reflected in the competencies of each action of the student already,” he said. Ngọc Anh suggested that some subjects are combined and others removed in order to reduce the workload in the new curriculum. She also felt it was important to providing key learning skills like brainstorming, outlining, note-taking, critical reading, critical thinking, summarising, synthesising, and evaluation to students of all levels. On the issue that most people were concerned about, the inclusion of career-oriented subjects, Anh said the draft plan included too many of them, making the curriculum needlessly cumbersome. She laid out subjects that she thought were essential and helpful. The compulsory list would include Vietnamese, Maths, Foreign Language, National defence education and physical education. 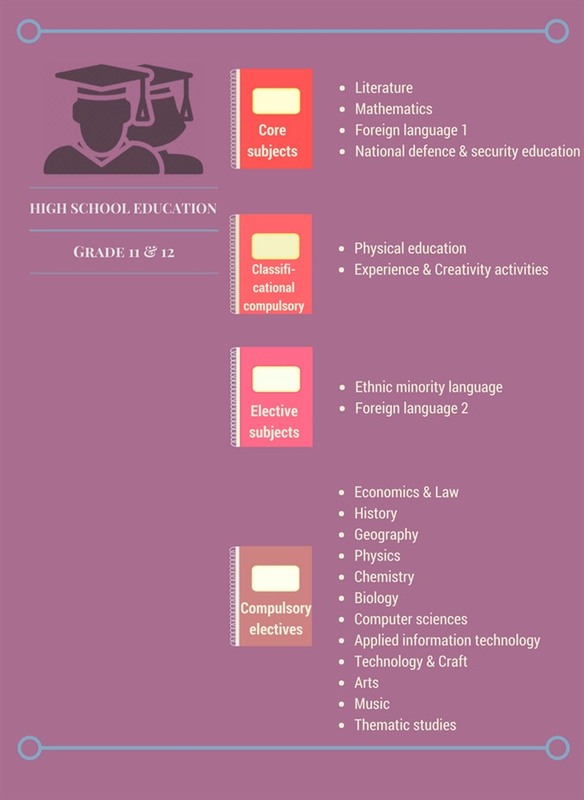 The career-oriented subjects, meanwhile, would include natural sciences (Physics, Biology, Chemistry); social sciences (History, Geography, Culture); Information and Technology Science; and arts (Music, Fine Arts, Design). Mỹ An of the World Bank said that successful implementation of the draft plan depends a lot on how the students are taught and how schools organise the instruction. The important of improving the quality of teachers was also shared by Anh, who said that, financial investments should be made in training teachers, designing curricula and teaching materials. The renovation in teaching method, however, could only prove effective if the method to evaluate students’ outcomes is done differently, Thuyết said. The draft curriculum proposed that students should no longer have to take the national exam at the end of their term to graduate. Instead, they would be evaluated on their overall performance over the high school years. “Currently, teachers hesitate to renovate their teaching methods because the students, at the end of the day, still have to take an exam at the end of their high school years. “(At present) If a teacher wants to encourage students to discuss problems, to work on research projects and so on, there will not be enough time to finish the designed lessons on which the final exams are based,” Thuyết said. “Hopefully this can change, and a change in the way students are evaluated can be a motivation for teachers to renovate themselves,” he said. Nguyên Ngọc, a well-known veteran author and novelist who is also very passionate about the country’s education system, said he found the high school graduation exam in France interesting and encouraging. “I think the mission of general education should be to prepare a student to be able to face and answer questions relating to contemporary topics. A high school graduate should be able to do that, and should be pondering about such questions.” Ngọc said. Financial support and proper facilities are other important factors for the success of the plan, Thuyết added. “Authorities of each locality would have to support us in this cause. If local authorities, who can regulate the use of land (for school) and financial budget, are not supportive enough to prioritise education, it will be a challenge,” he said. Meanwhile, Mỹ An from the World Bank said the role of the Government and society would be crucial. During the twelve years of general education, you can learn a lot of things, but you have to be able to come up with your own answers to current problems. Isn’t this the mission of education? A general education should help create an individual who is independent and free-thinking, because only such individuals can face a world that always poses questions. Although we didn’t mention the word "education philosophy" in the draft… . I think a group of people drafting a plan can’t come up with a philosophy for the whole society… but I think the philosophy we want to talk about is embedded in the details of the draft: that we’re going to help create students who are independent, free thinking and able to solve the problems they face with all the qualities and competencies they’re getting after 12 years. The curriculum is also democratic. We’re not imposing a rigid plan, but one that schools can adapt flexibly, according to their own conditions. Of course, to be able to do this, we’ll need support from the government, the willingness of teaches to change, and the satisfaction of society as a whole. In order to achieve the goals of the curriculum, Việt Nam needs to develop a reading culture in schools and communities. The school and family environment needs to be designed to support this, with in-classroom small libraries of reading materials of different disciplines so that students can develop reading skills, research skills, presentation and teamwork skills. There needs to be flexibility within the school, too, and the classroom concept needs to change. Instead of sitting in one classroom throughout the school year, students should move to different classrooms depending on the course they have enrolled in. I think the most important thing for education renovation is that teachers themselves have to adjust to what the current requirements are. How can they change? They have to be able to incorporate STEM (science, technology, engineering and mathematics) content and methods as a major aspect of school curriculum, not a minor or partial aspect). They can also apply scientific methods and project-based curricula for the subjects that are taught, enabling students to have the necessary skills and abilities upon graduation. Changing teaching and learning styles in this way will help teachers adapt to continuous change and create a constant learning process. In this process, new skills are acquired and new ideas generated, and people become better teachers. It is only such teachers who can foster a generation of independent, logical, critical and creative thinkers. Teachers should be motivated to learn constantly and they should motivate students, instead of imposing knowledge on them, encouraging the latter to think like real engineers or scientists. Teachers should also be connected with the community. They should have the opportunity to work and collaborate with scientists, researchers, professionals, and colleagues in other places so that they can develop highly effective lessons and exercises for the classroom.